Barcelona superstar Lionel Messi has advised James Rodriguez to leave Real Madrid in order to save his career, according to reports. Messi is believed to have sought out the Colombian after the El Clasico to offer his support. The former Puskas award winner was left on the bench by Real Madrid boss Zinedine Zidane, who even preferred Castilla striker Mariano Diaz ahead of the playmaker as a second-half substitute. 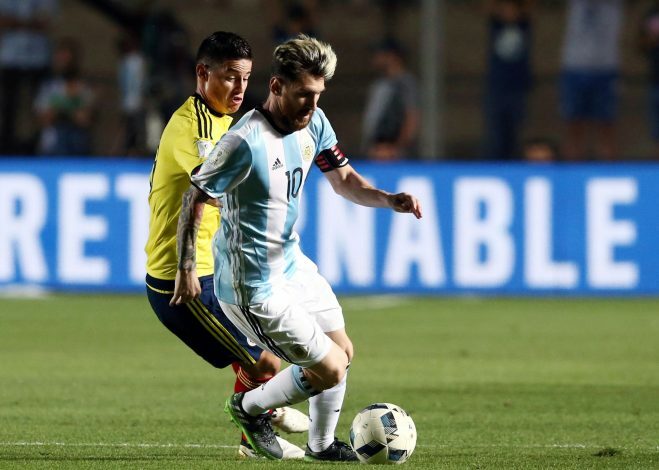 Messi reportedly urged James to look for a move away from the Spanish capital, and find a club where he can have regular game-time and prove his talent. The Argentine is said to be a big fan of James, and believes he’s selling himself short by staying with Real. The Colombian midfielder is rumoured to have been in a bad mood due to lack of regular game time. However, his misery could soon come to an end, thanks to new reports suggesting Manchester United would prefer a swap deal with Real Madrid, which would involve Anthony Martial and Rodriguez heading in opposite directions. Martial is rated around £60m, after having emerged as the Red Devils’ top scorer in his debut season at Old Trafford. However, the 21-year-old has surprisingly found it extremely difficult so far under new manager Jose Mourinho, with the ever unpredictable tactician demanding more goals from the France international. Barcelona have also entered the race, as they did back when Martial was still in Ligue 1, but James Rodriguez’ situation in Madrid, and Mourinho’s intent to land the Colombia international, makes the Los Blancos favourites for the Frenchman’s signature.